My latest poster, "you ain't never had a friend like me" is 12x36, 11 colors including metallic inks, printed on black paper and was released with Cyclops Print Works on Oct. 16th. It sold out immediately, but I will have a few personal copies available this Friday, Oct. 30th through Bottleneck Gallery. The first idea I pitched was to have a bunch of the different celebrity forms erupting out of the lamp, with Genie coming out at the top. I was excited about showing the range of Robin Williams, but in the end I found all the caricatures to be a distraction rather than a fun nod to Robin's talent. 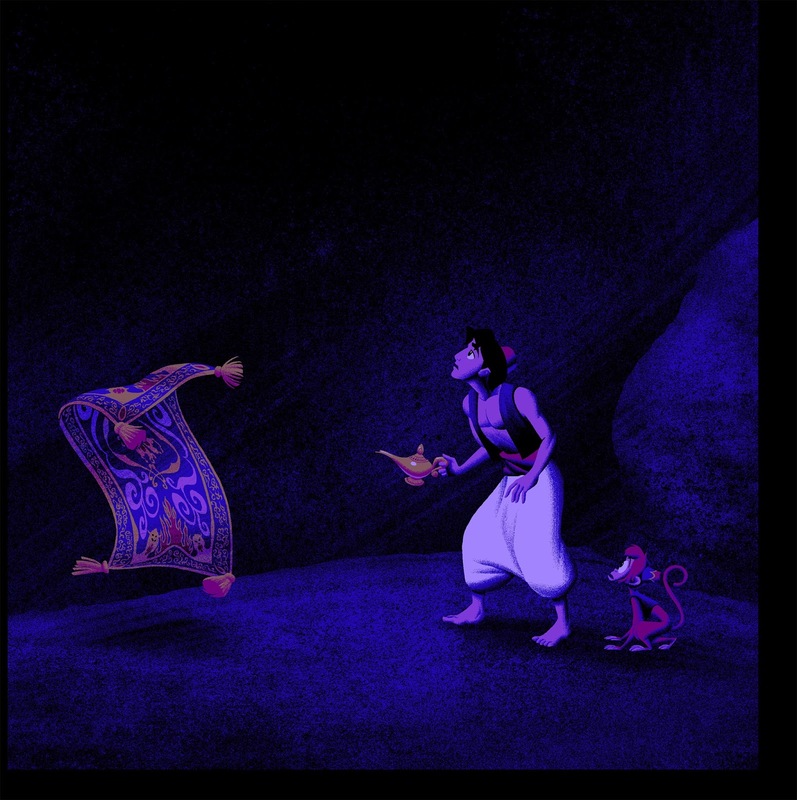 I whipped up another color sketch, this time focusing primarily on Genie emerging from the lamp. While working on this I stumbled on the idea of hiding Jasmine's face in the smoke and I was glad to keep the recurring theme of the hidden love interest going with my Disney poster work. This concept got approved and I started drawing. I started work on the figures, since that is usually the most fun part. 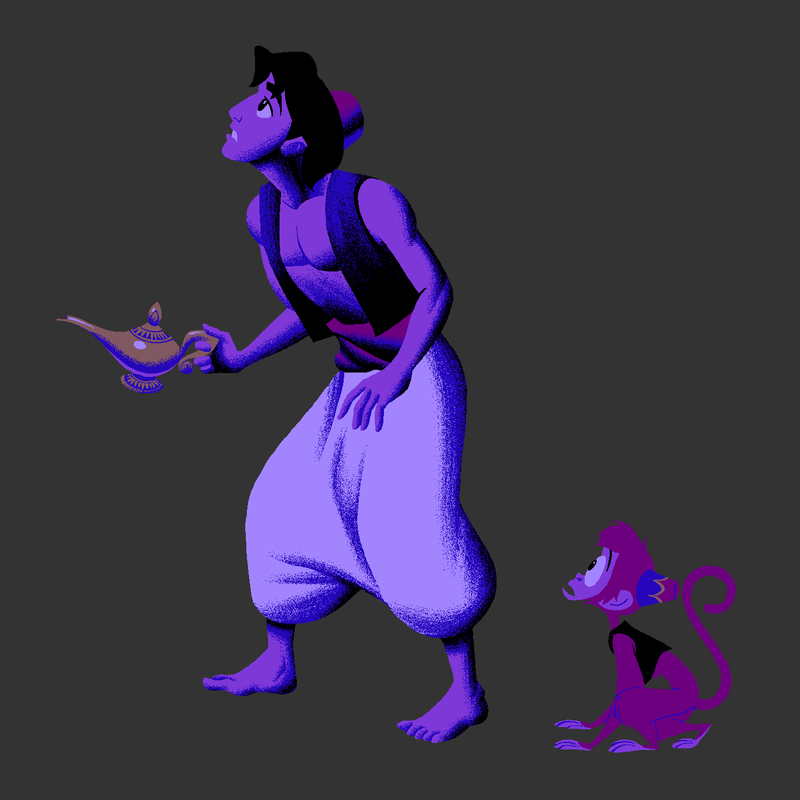 Here's a mostly finished Aladdin, with Apu blocked in with solid color, no rendering. 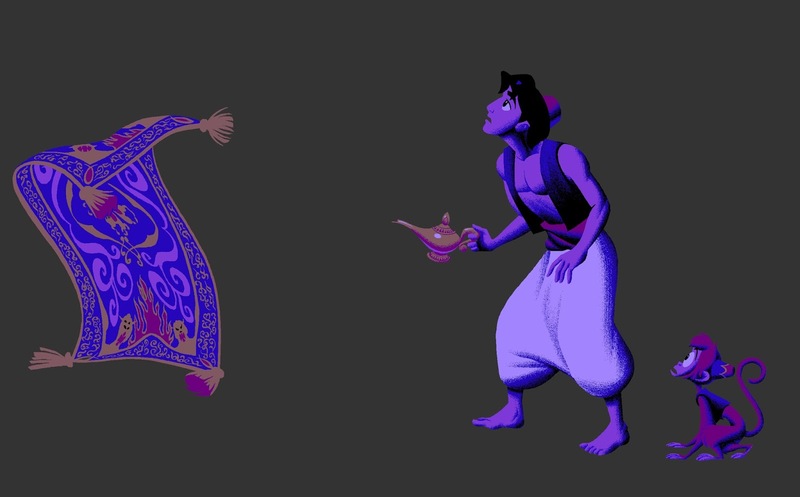 After I rendered Apu, I blocked in the solid shapes for the magic carpet... which took me quite a while. I knew a lot of the details would be covered once I added shade to the carpet, but I need to start with an accurate under drawing before I render. Now that the three characters along the bottom are finished, it's time to get to work on all the Genies and the smoke. I toyed with having the genie figures lit bright pink from underneath, to match the scene in the movie. Once I started drawing the smoke, the pink just looked weird so I changed it to blue. As with most anything I draw, I roughed in a solid shape for the smoke and then went back in and added details. With smoke and clouds, it always takes several passes of detail, adding and taking away, so I can get that solid yet wispy feeling. After I finished the smoke, I sat and drew tons of little sparks and magic dust type stuff all over the place and bam, I was done! art work is too good and story creates after just looking these art work The Benefits of Mindfulness at Work thank for such a nice art great post.. Thanks for sharing. I will certainly visit your blog more often. Blogs are something that I like to read.